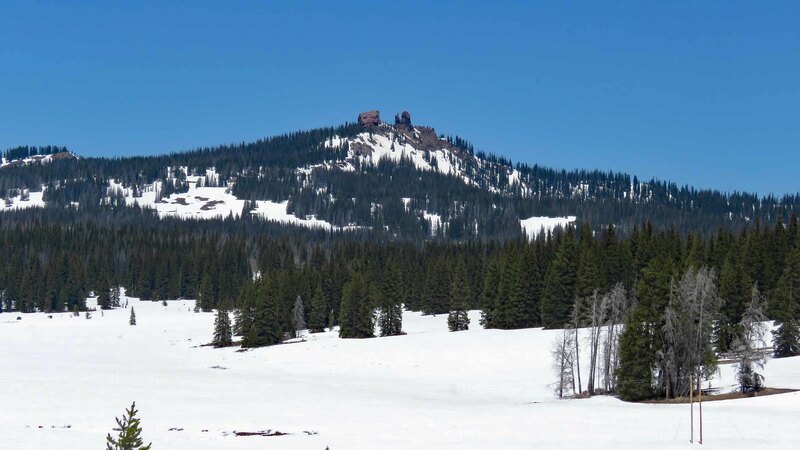 Follow us as we take a long loop around northwest Colorado to see what the early spring has to offer. We were on the road for 8 days so please bear with us as I will have to break the narrative and photos into two or more parts. 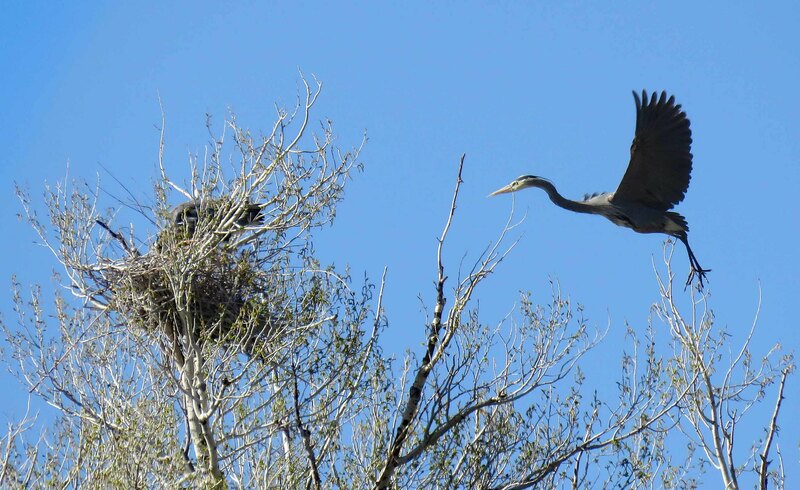 We like to travel in early May to take advantage of the lower traffic and easier lodging available. Sometimes you get special flowers, birds, and animals along with the ability to stop on the roadside safely. 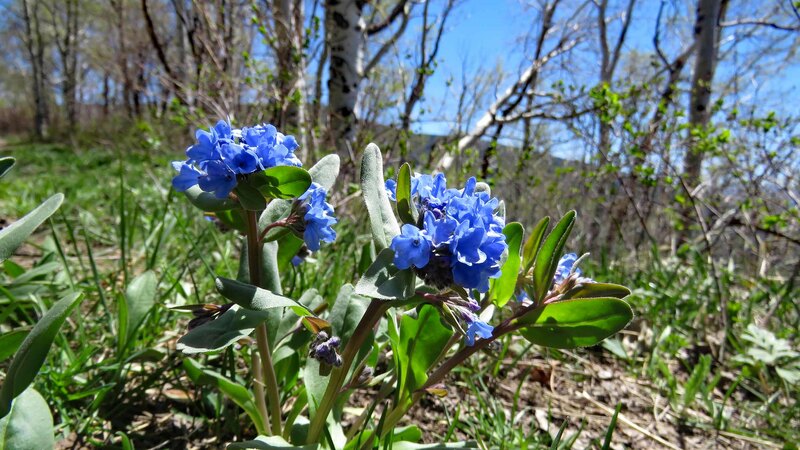 Rabbit Ears Pass east of Steamboat Springs is an amazingly scenic vista and just might offer a look at one of our favorite spring flowers. But first... the Rabbit Ears! Late last year one of the "Ears" broke off and fell down the mountain. It is still a great view - and, at that time, a LOT of snow was still piled up. 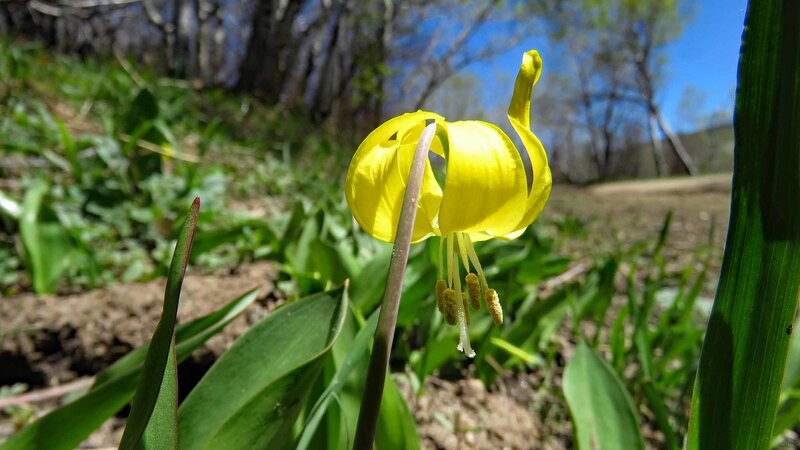 Our favorite flower - the Glacier Lily! 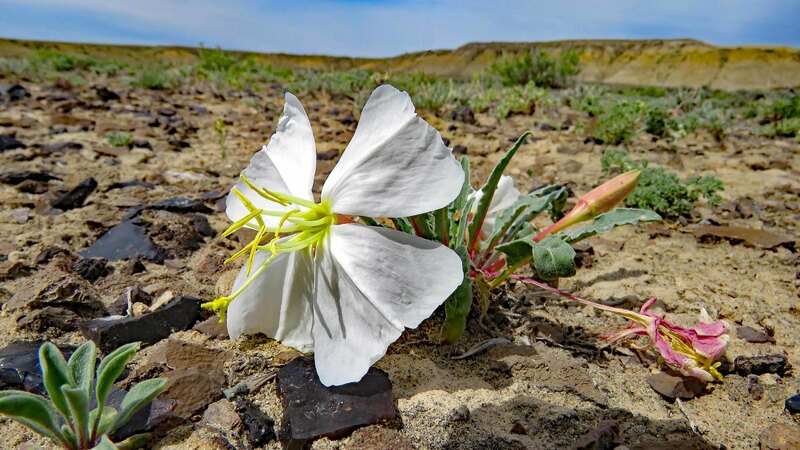 At the right time (NOT this trip) you can see the hillsides carpeted with this flower. 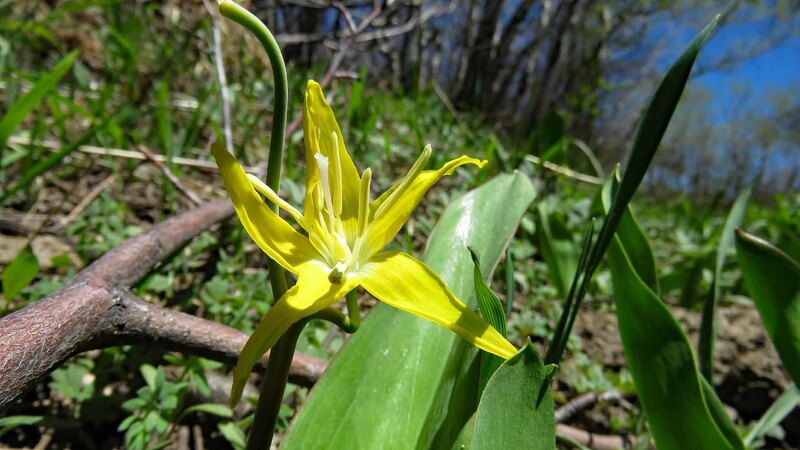 These two Glacier Lilies were on a "turn-out" on the west downslope of the pass. The lilies come up quite soon after the snowpack (feet in this area) recedes - and it had barely started this early in May. There are other flowers blooming but you have to look closely for them at this time. This yellow cluster is Hollygrape sometimes AKA Oregon Grape. Here is a blue cluster flower that I really could use the "brain trust" of pinecammers! 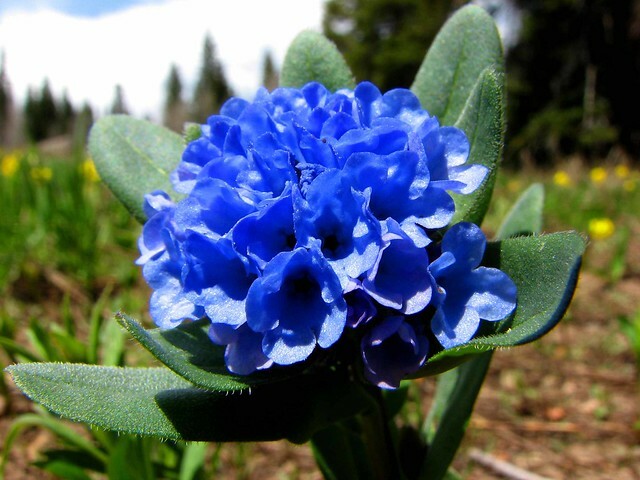 Thanks to the "brain trust" of pinecammers, the flower is Mertensia alpina! I first photographed this more than 10 years ago and have since lost it's true ID. We (BGRs) have nearly worn out our alpine/sub-alpine flower books searching for that lost name. Please chime in if you know this one. The clusters get more than double the size seen here as the flora explodes when the snow retreats! 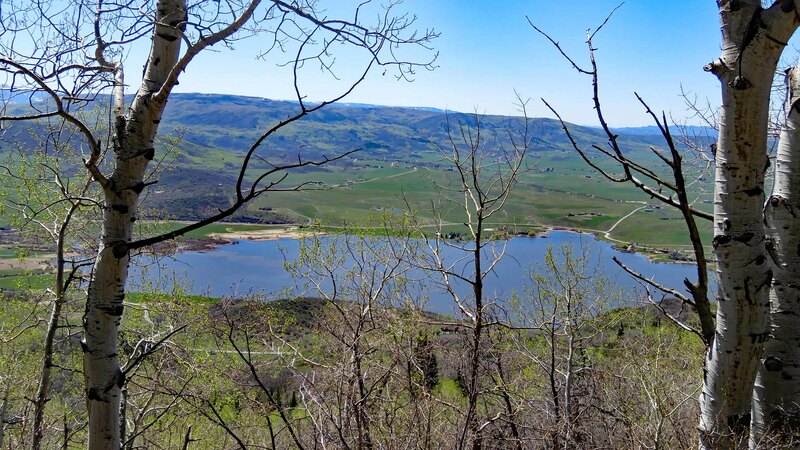 From that same "turn-out" we caught this view of Stagecoach Lake, a very large site in the Colorado State Park system. 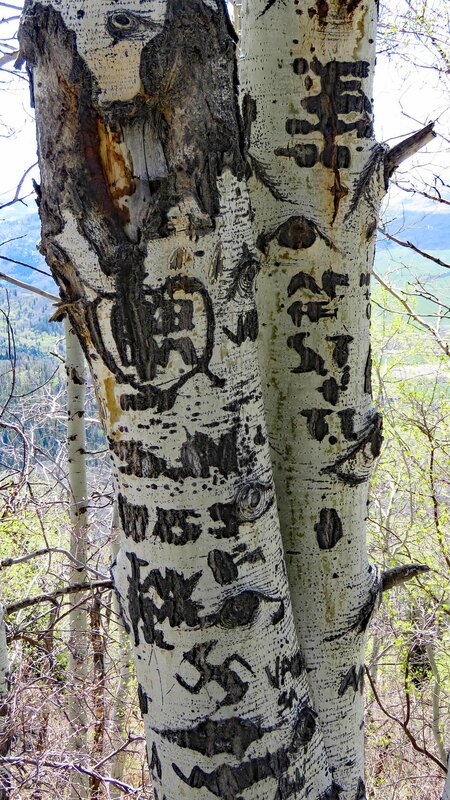 One last photo from Rabbit Ears Pass of what I have named "Arbor-Glyphs" to try to put a better viewpoint on defacing trees. We left the pass and headed for Craig, Colorado. Keep you eyes open on US-40 as there are many interesting sight along the way. 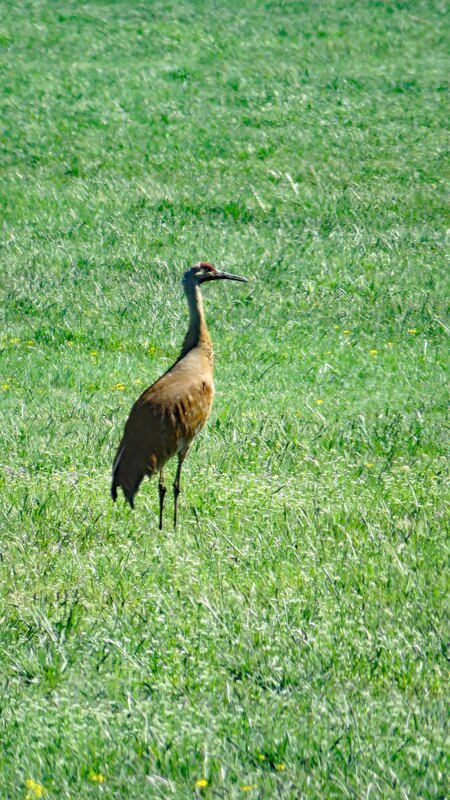 You might see Greater Sandhill Cranes along the Yampa River wetlands. 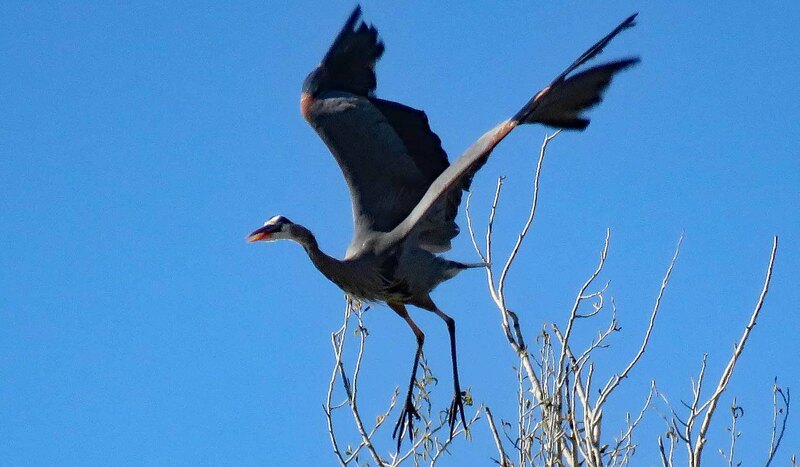 Notice that they have molted their grey feathers (seen during the migration in San Luis Valley) and are in full "rusty brown". Our first stop after offloading at our hotel in Craig and went to the Loudy Simpson Park along the Yampa River on the south side of town. This is one of the best community parks we have seen in Colorado. 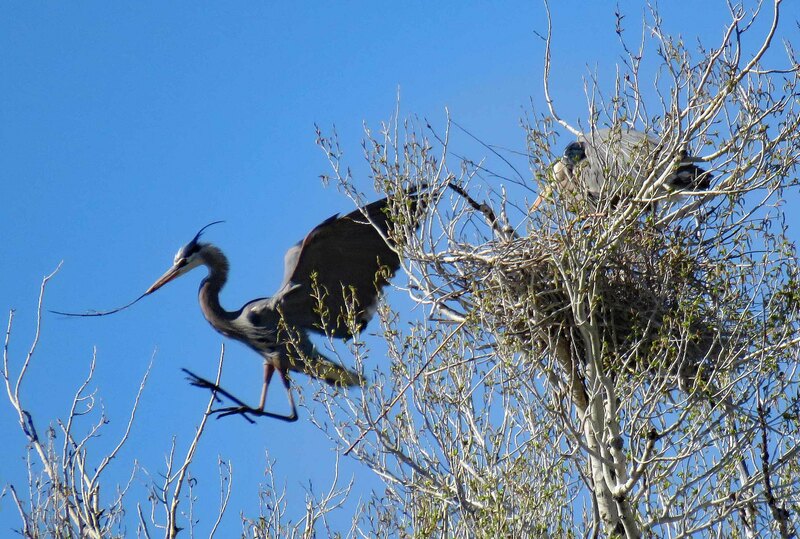 Being right alongside the Yampa, there are numerous wetland features in the park for bird watching and fishing. 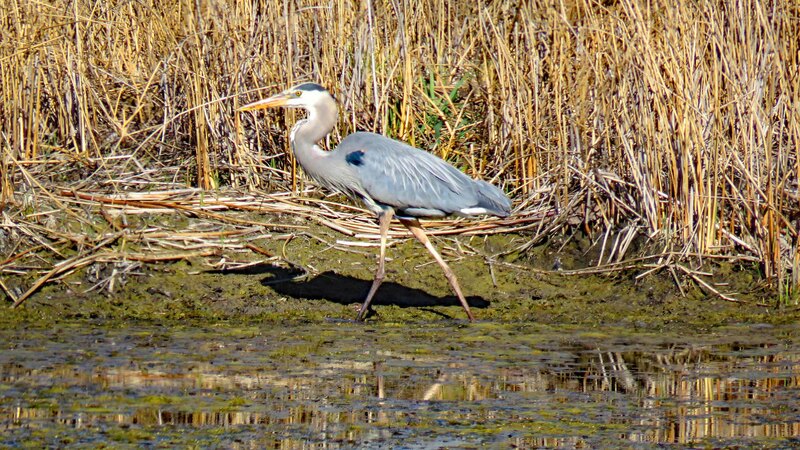 We discovered the "motherlode" of Great Blue Herons. 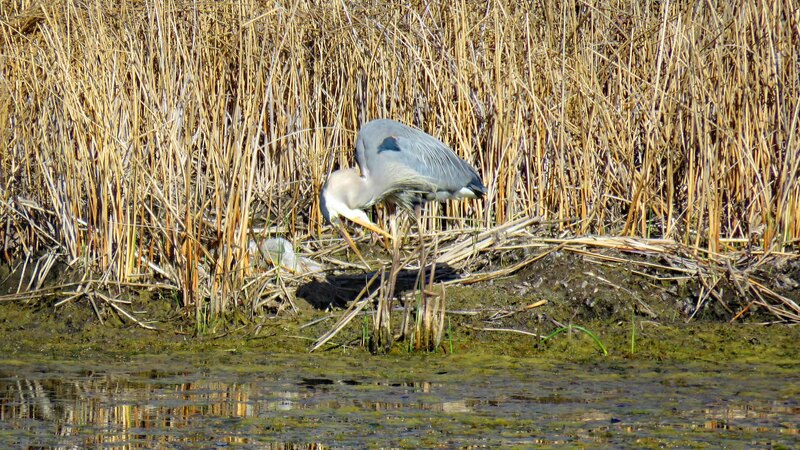 I don't know whether this one is preening or just choking down it last fish! 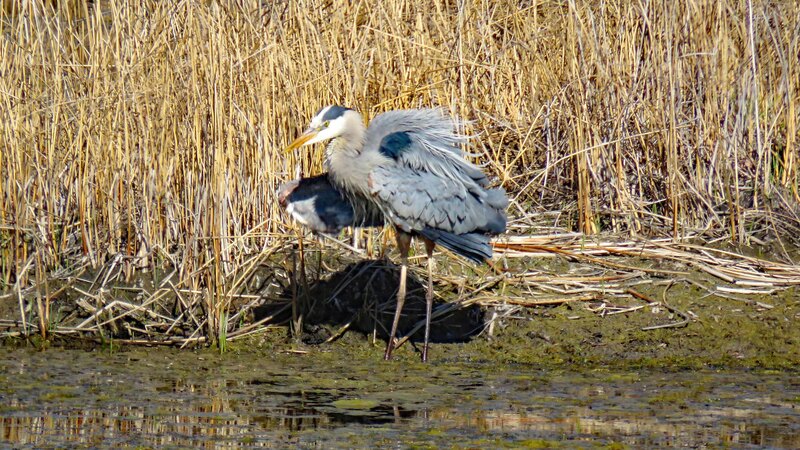 Of course one has to look good - so give those feathers a shake! "Ugh! 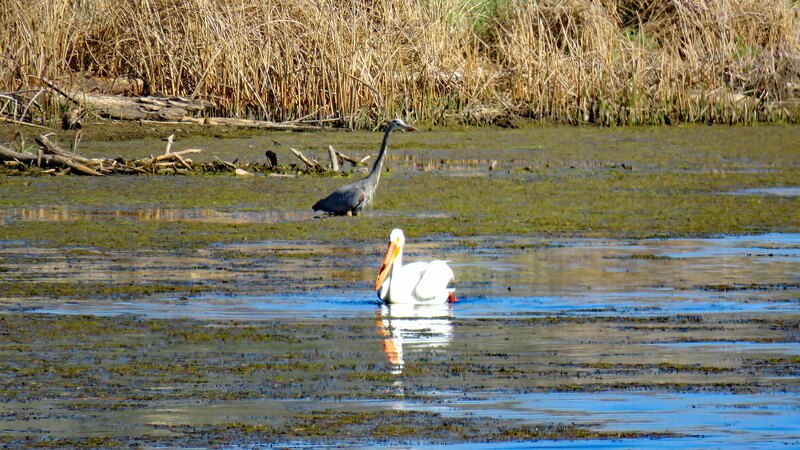 We have to share our favorite fishing hole with Pelicans!" One can drive around the Park to see other activities ranging from disc golf to R/C car tracks and great picnic spots. 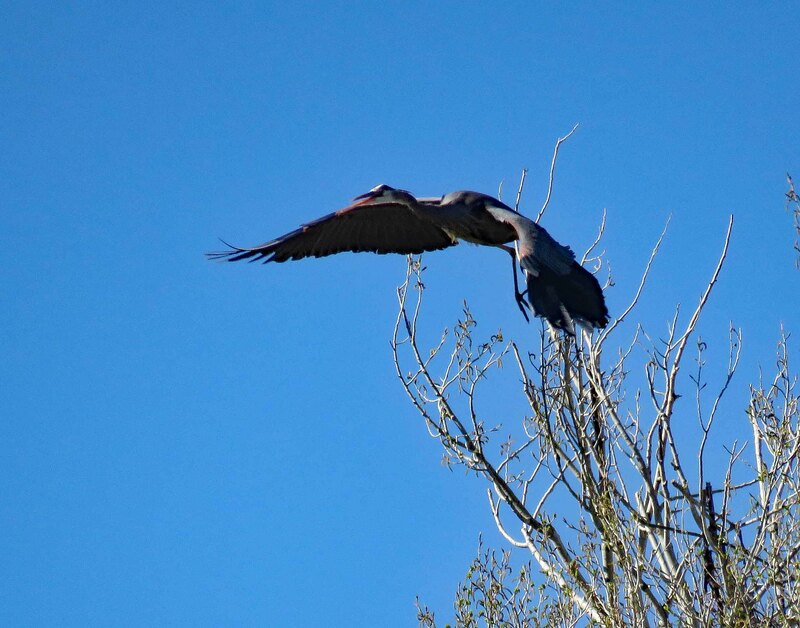 Gazing across the disc golf wickets we found a huge "rookery" of Great Blue Herons! 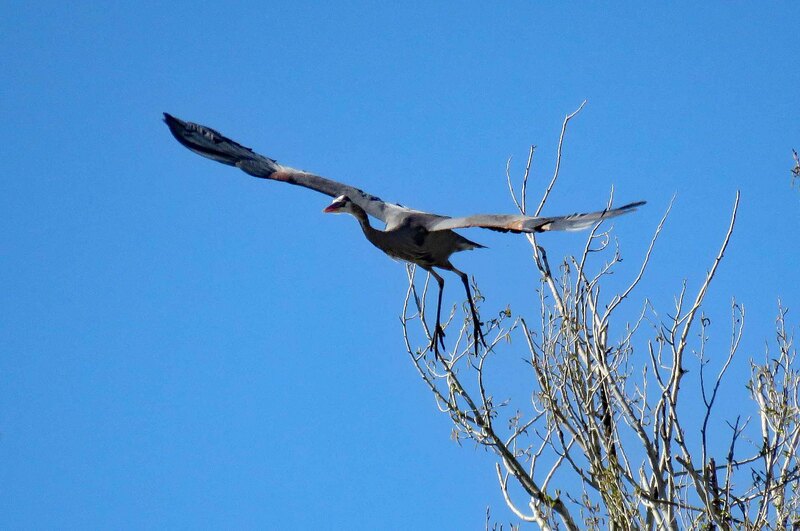 Here is a "launch" series as this huge bird "catches air!" 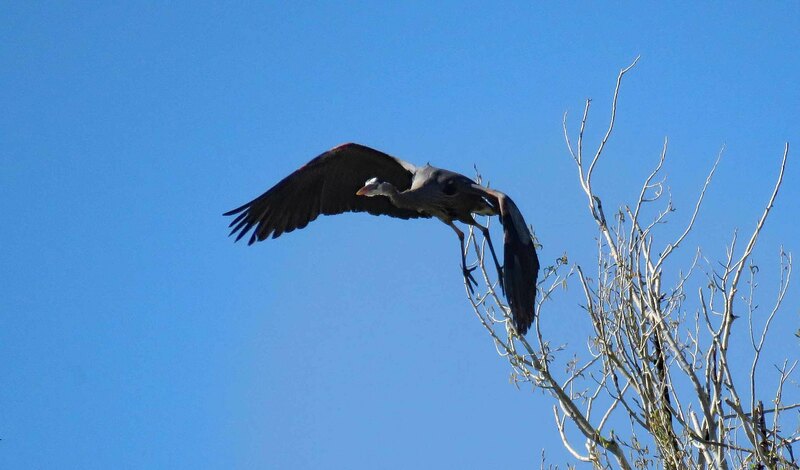 This particular rookery is a busy place! Got to keep those fish coming in for the babies! Just around the corner about 1/4 mile east is a pond full of Pelicans. 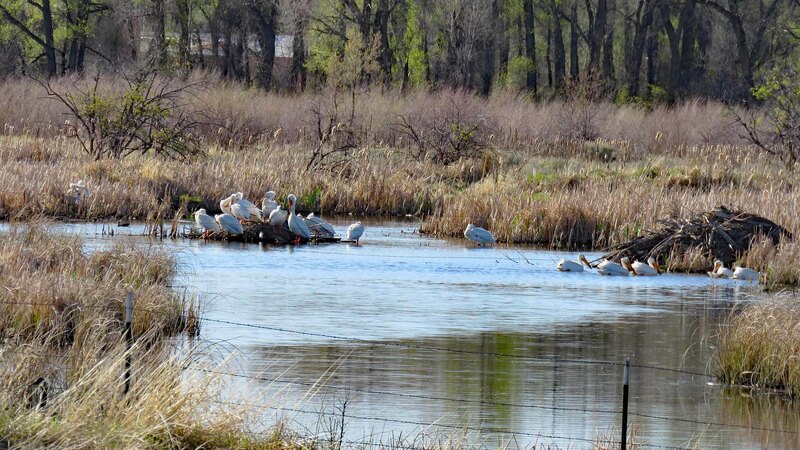 Just in case your pond gets too crowded with fish, a flock of Pelicans will clean it out in a few days! The next day (day 2) we headed out towards the Sandwash Basin to see the wild horses. On the way just a couple of miles short of Sandwash, we always turn in along the Little Snake River to see what birds might be there. 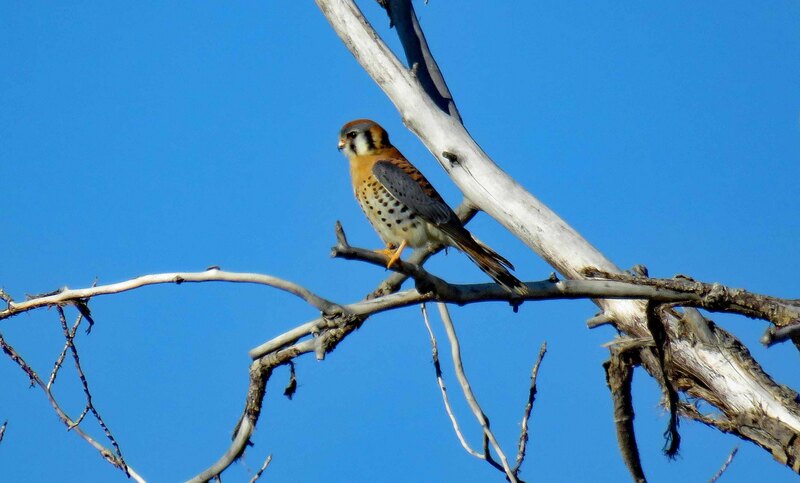 A surprise was this American Kestrel who was kind enough to stay until I could get this shot. 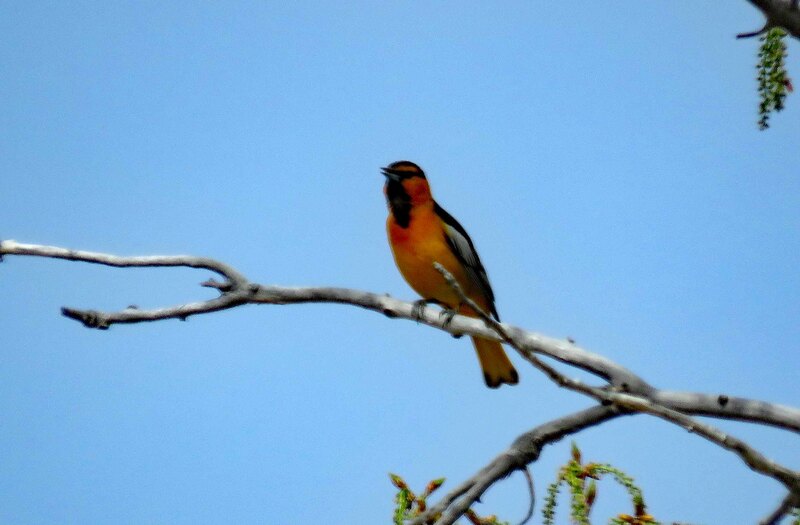 Another rare (for us) bird was this Bullock's Oriole. 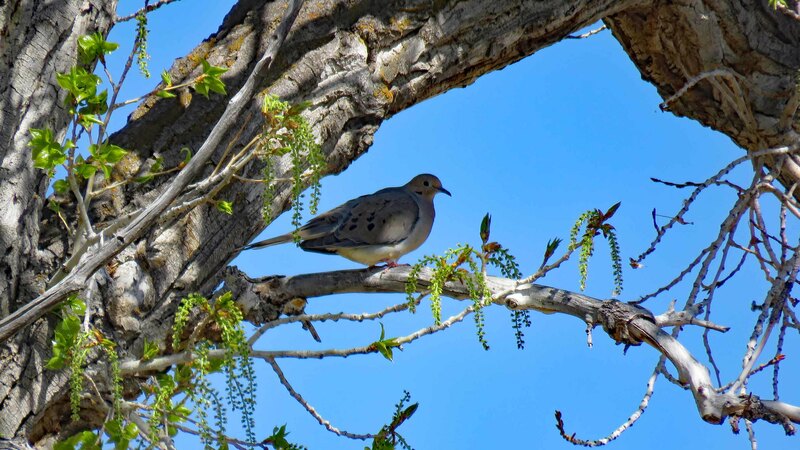 Here is a Mourning Dove in the Cottonwoods along the Little Snake. Onward into the Sandwash Basin and over the Wild Horse Loop. 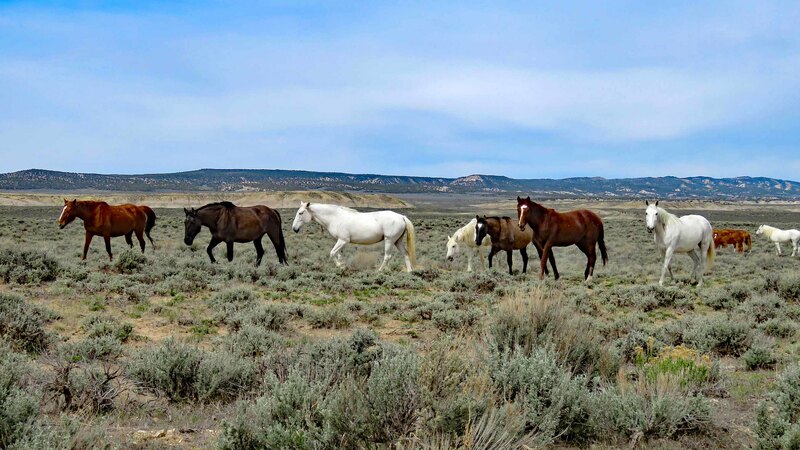 One never knows what might be seen while driving those long dirt roads up to 26 miles north and more going south, west and east. Be sure to get a map at the Visitor's Center in Craig or at the Town Park in Maybell. Please don't try these roads if it has been raining more than a light sprinkle. The bentonite dirt turns to serious grease when wet. Not more than about five miles in on the east side we found this herd. 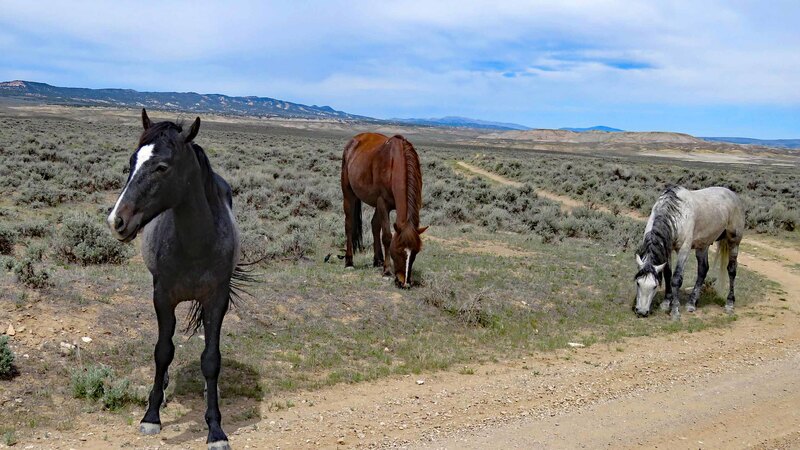 It is their road so the horses really don't care if you are there. 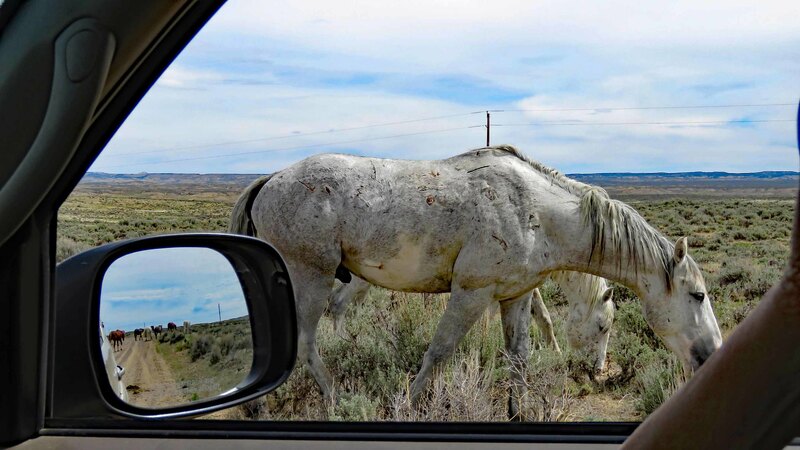 Check the view in the mirror plus the stallion next to the door. 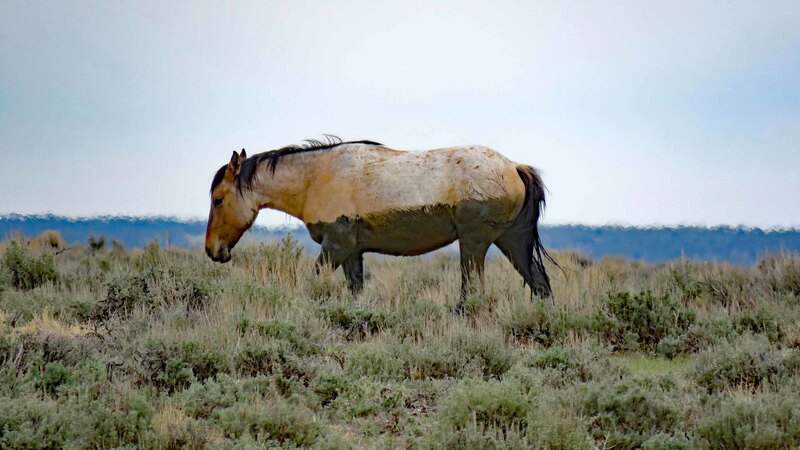 What a beautiful paint stallion! 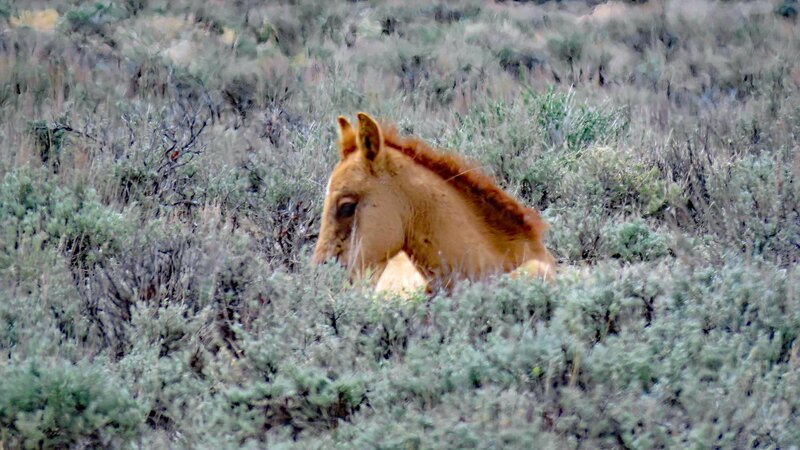 Note the "blaze" on the forehead of the grazing stallion. Just in case I might have been interested in "horning in" on his mares, he issued this challenge quite clearly! Got the message Loud and Clear! 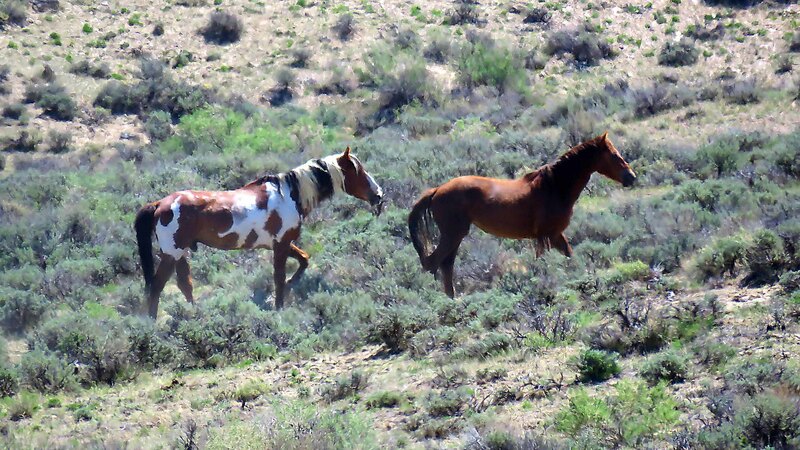 It is more than just horses in the Sandwash. Here is an Evening Primrose fully opened even with the bright Sun suggesting that it might want to close up before it gets sunburned! 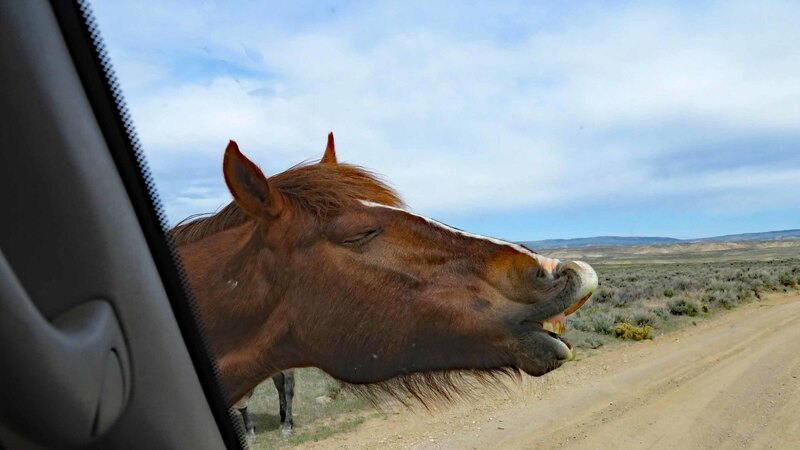 There are times when your eyes need a break from just horses! The new colts are simply breathtaking! 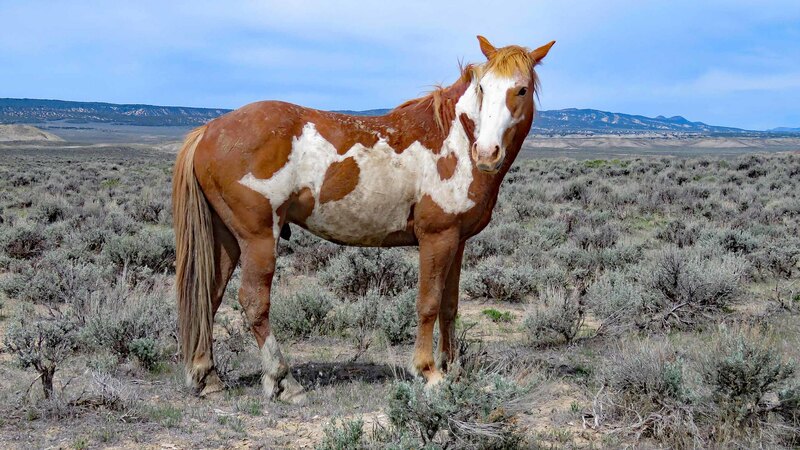 Is this the "horse" version of camoflage? Just been wading in one of the water/mud holes scattered around the Sandwash. 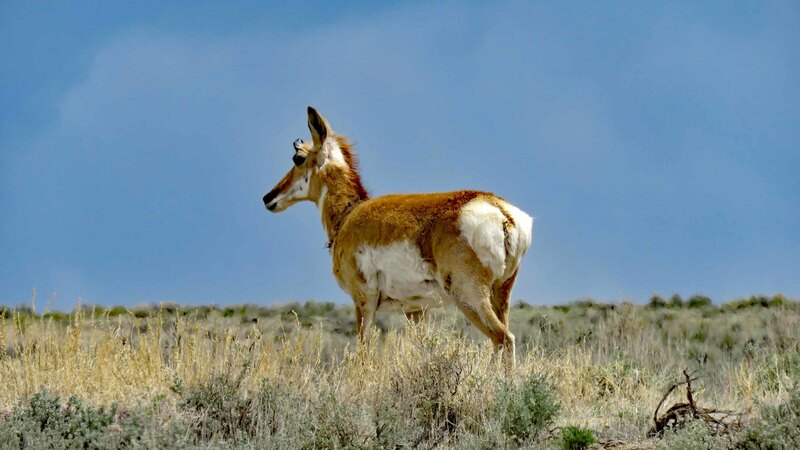 Keep your eyes peeled for Pronghorn Antelope! You have never seen anything faster when a herd of these break into a full run! We decided to head back to our hotel in Craig but still grabbed the following shots on the way out of Sandwash and along Moffat CR-318. 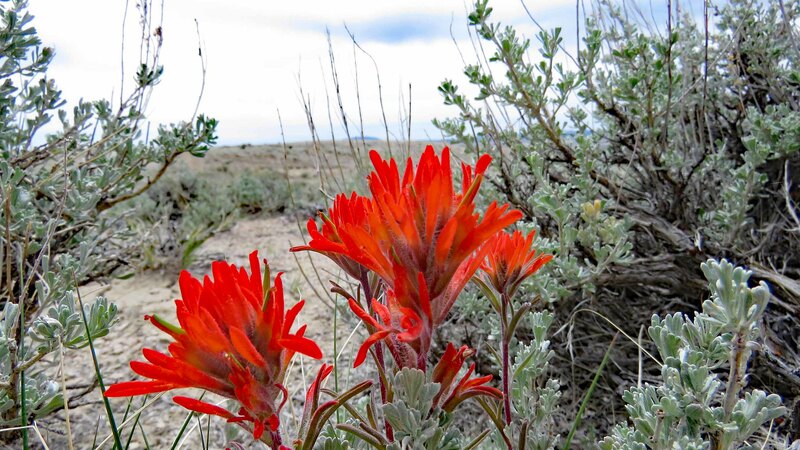 This is Paintbrush posing incredibly bright against the sand and sage in the basin. 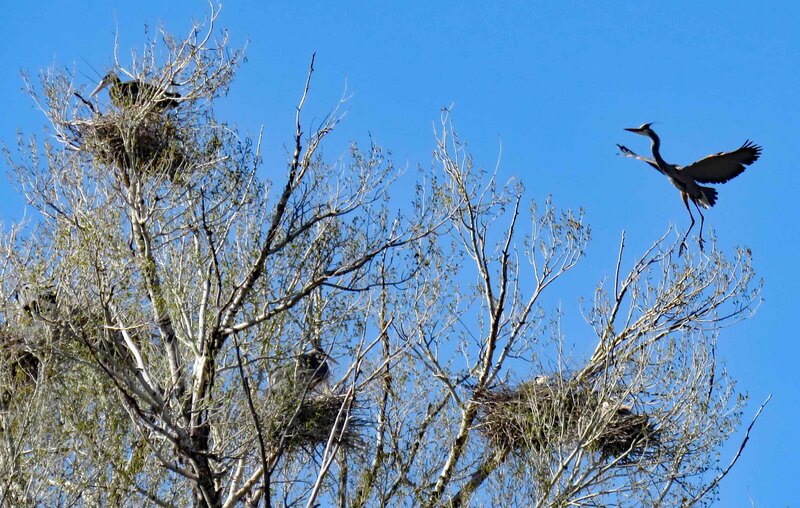 There are several hawk and eagle nests along CR-318 and US-40 but you need a sharp eye to find them. 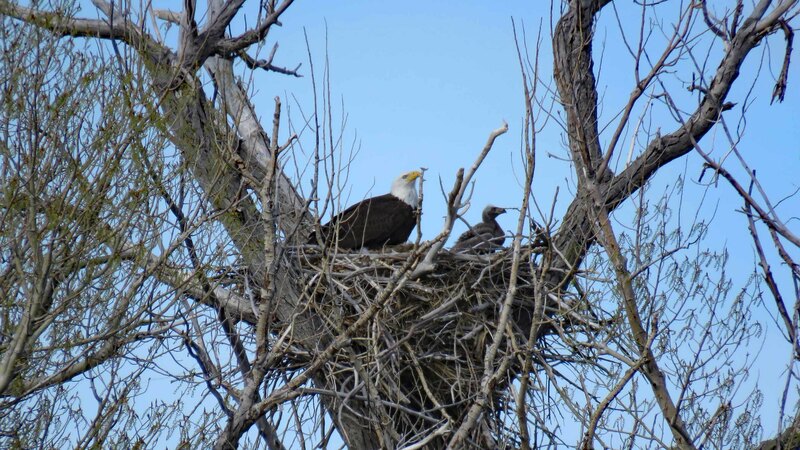 This Bald Eagle nest is only a few miles east of Maybell, CO, and close to the Yampa River. 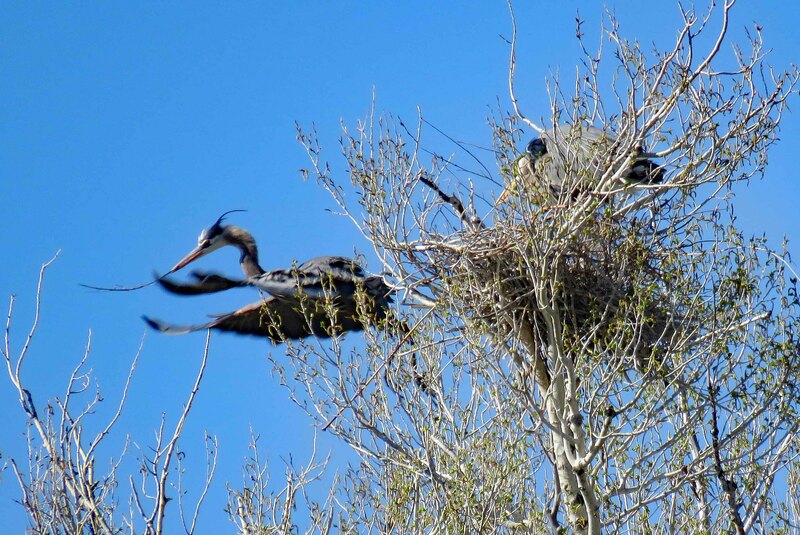 We could only see one chick in the nest with mom and we did not stay long enough to see dad who is undoubtedly out catching fish in the Yampa. 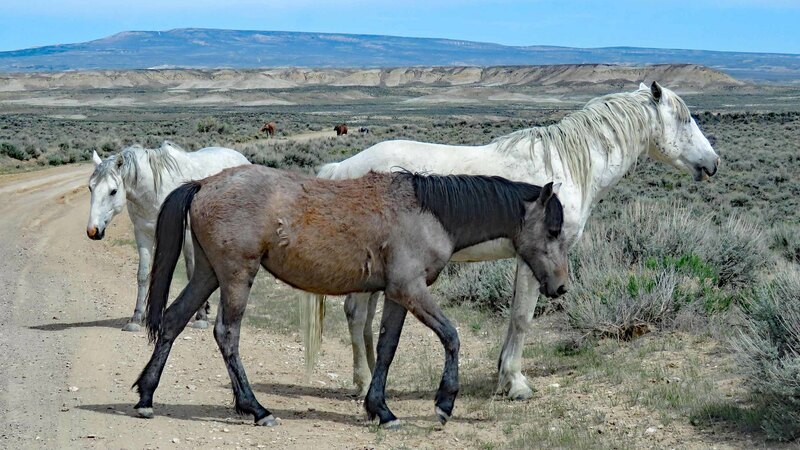 After getting a good night's rest, we were back out to the Sandwash Basin to drive the Wild Horse Loop again. 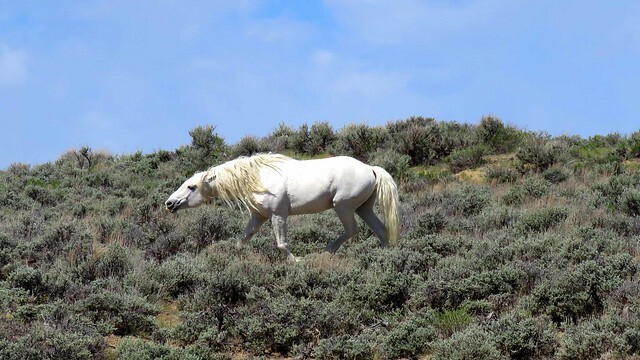 This white stallion was seen chasing after his "harem" of mares obviously worried that he might have let too much distance get between him. 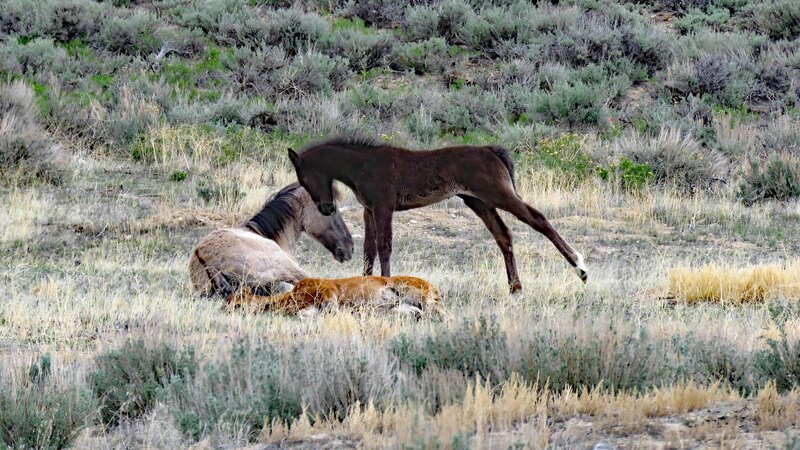 This is the black foal and the sorrel mare he was chasing. 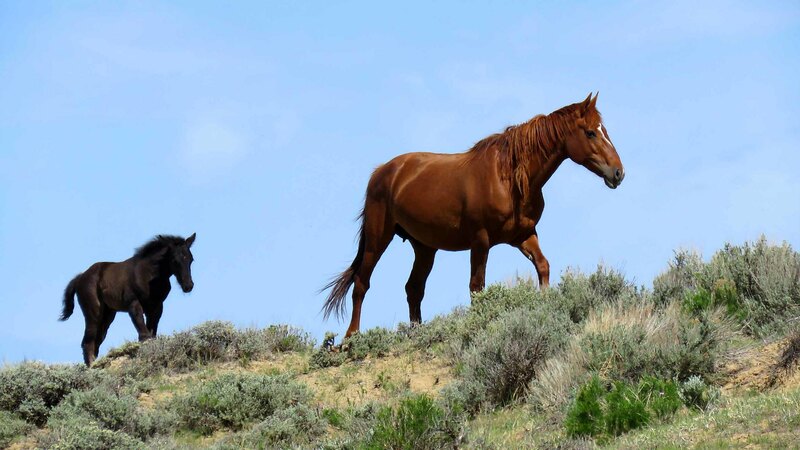 Remember to look up while searching for wild horses! 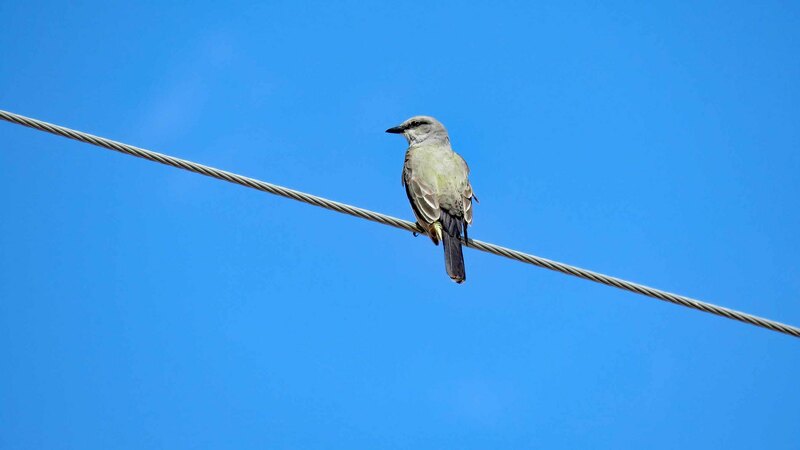 On a power line we saw this King Bird watching for a bug in the dense sage. 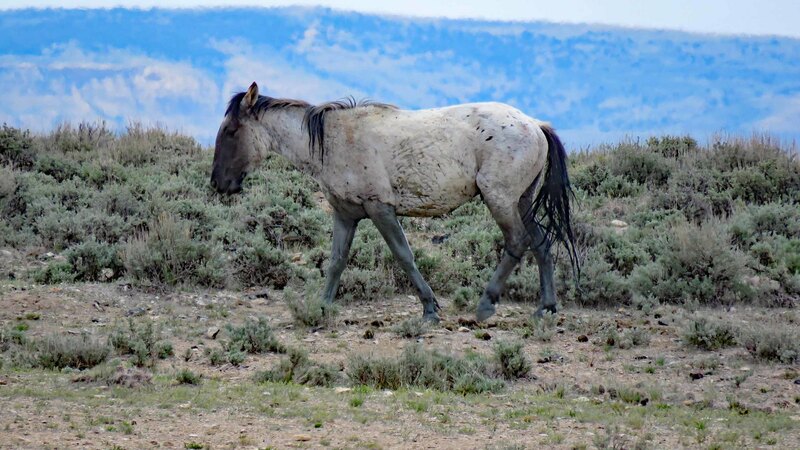 This is the current "Prize" of the Wild Horse Loop. 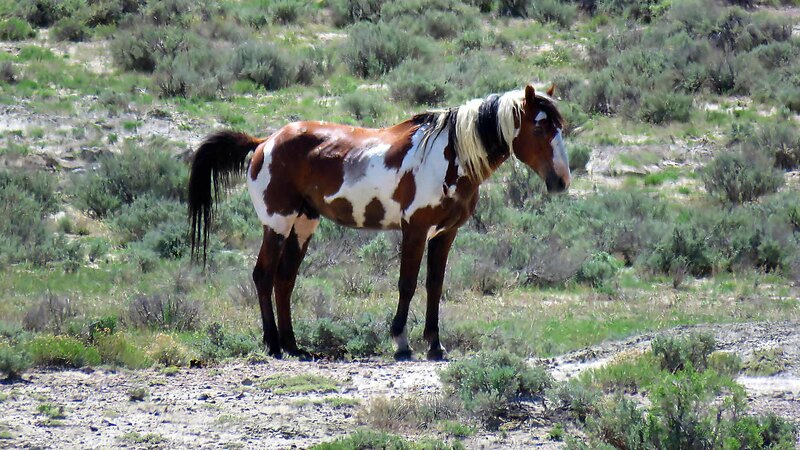 This is a paint named Picasso by the large fan club that closely follows this herd. If you are on Facebook, search out this particular club. 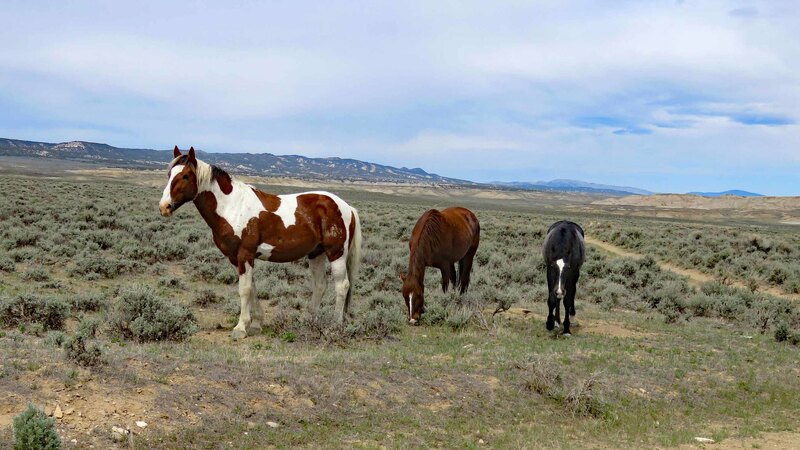 I am sure they have given names to almost all of the horses you might see there! This is Picasso with his current love/lust interest, Spirit Dancer. 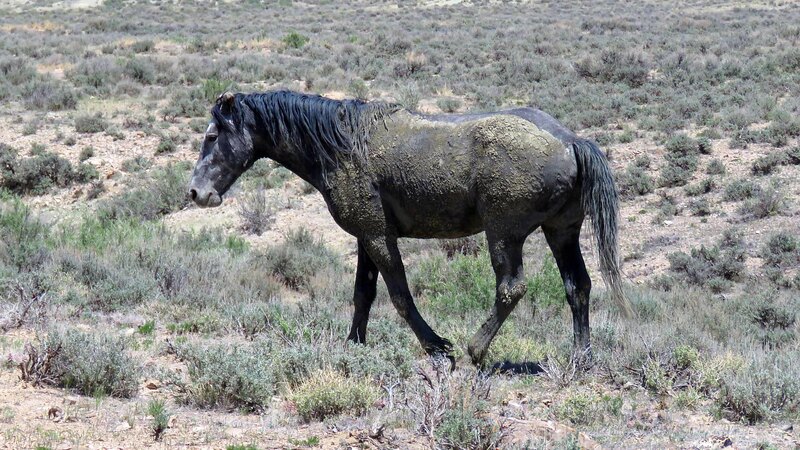 There are several "water holes" scattered around the Wild Horse Loop. 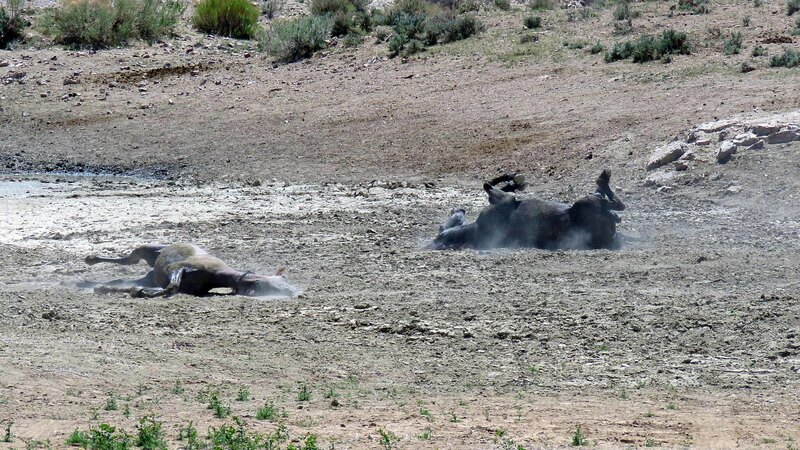 If you can find them - and - if they have water, just sit in your car nearby and wait for different herds to drop in for a drink. 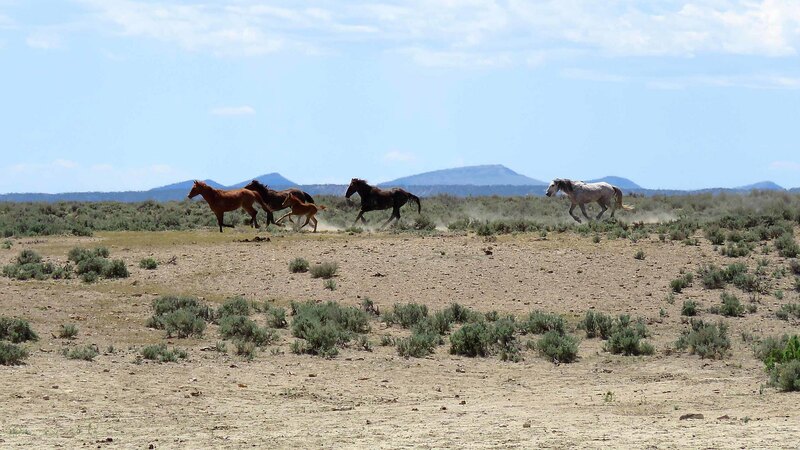 This is a small herd that realized it was their turn for the water! 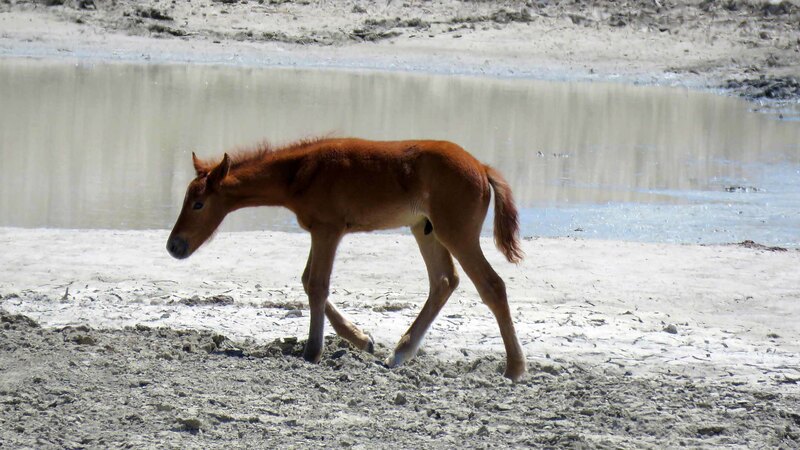 Here is the horse colt from that herd strolling by the water after tentatively taking a drink. 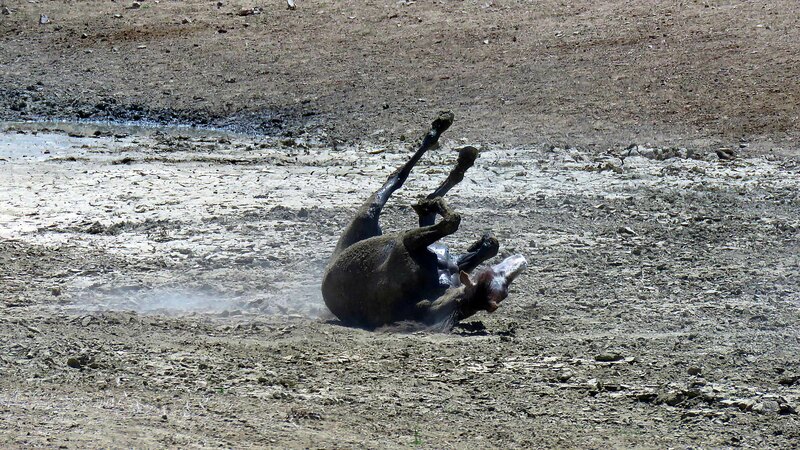 After a dip in the water there is nothing that compares to a good roll in that cool mud! Another must have thought the roll in the mud was a brilliant idea! Even got the "coat" that says, "Been there, Done that!" That is all for the first three days of the trip. Please stay tuned for going to Rifle, Palisades, and Grand Junction on days 4, 5, and 6 of this tour! Last edited by BeerGodROX on Jun 24, 2018 10:37 pm, edited 2 times in total. Great Photos, thanks for sharing. What a team you guys make! See ya when you return, Have fun. Gorgeous! Can’t wait for the next group of photos! Wow, just wow! We always go southwest. Looks like a loop around the north is long overdue! My best guess on your blue flowers on Rabbit Ear(s) would be one of the Veronicas, Speedwell or Serpentine. You never disappoint! I love traveling long with you guys! First glimpse I thought the flowers were sky pilot, Tea and I saw them up on Evans this week. But the leaves are wrong. Someone’s got to know! Yep, leaves are wrong. I withdraw my guess, but still need to know! This was near Rabbit Ear(s) at a high elevation, right? 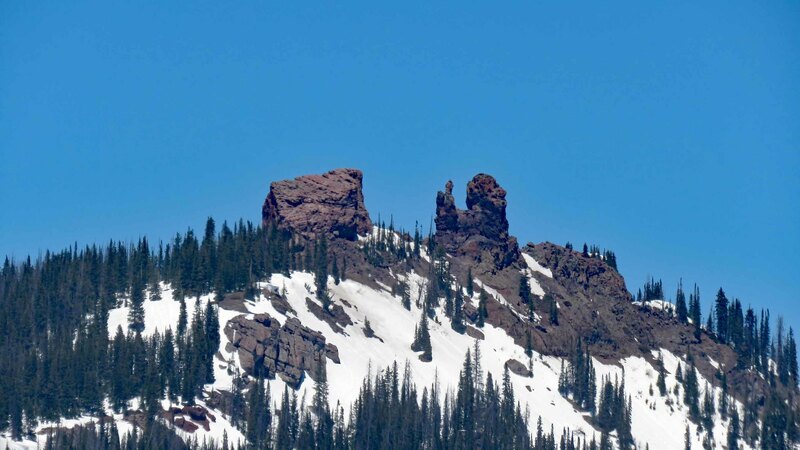 I guess we'll have to call it Rabbit Ear Pass now, eh? Yes. Sub-alpine region, mixed with Glacier Lilies near the edge of receding snowbanks. I am stumped. 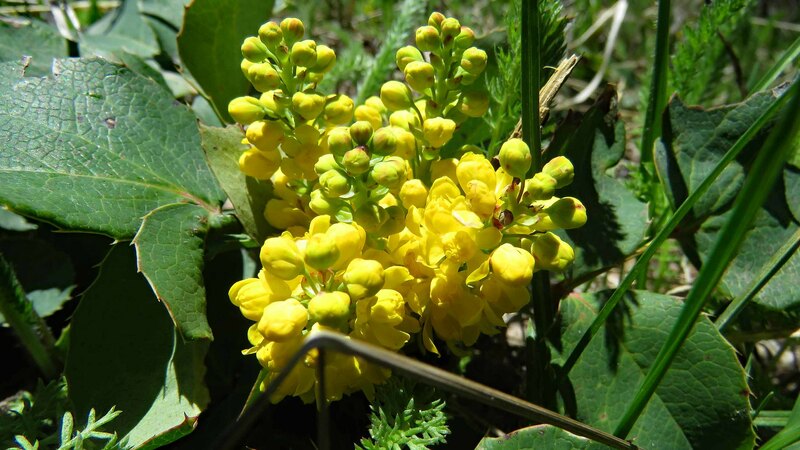 I have two Colorado wildflower apps and have searched more than a dozen characteristic combinations, and get exactly zilch. Veronica is the closest result. 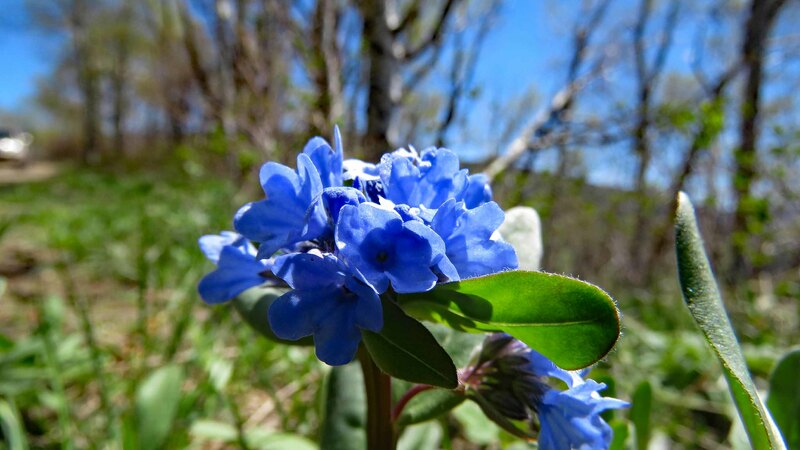 I went back in my IPhoto treasure trove and found that blue flower taken in May of 2007! This shot ought to give a better clue because the leaf pattern is fairly distinctive. The leaves look like a type of succulent plant. 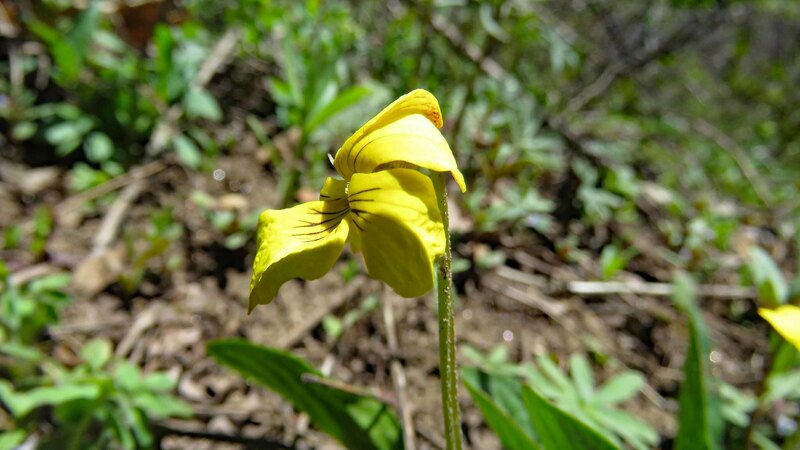 That would be barely subalpine as it was found among the glacier lilies, aspen, and lodgepole pine. If you look in the background you can see the yellow glacier lilies. I'm sure that the snow pack before the meltdown had been at least 6 feet deep if not a lot more. I truly appreciate those of you who are inclined to "dive in" to the search for this beauty! "The distance between who I am and who I want to be is separated by my actions." My goodness, you two can really spot the wildlife and flowers. What sharp eyes you have! 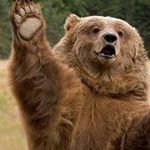 Thanks for the photos, we don't travel much any more and I really appreciate you sharing your travels and great pictures.